Extensions provide additional functionality to core CiviCRM. Extensions are the recommended way to create new features and change the way that CiviCRM works, especially when these changes are not needed or desired by the entire CiviCRM community. Many people write extensions for their specific use cases and install them on their CiviCRM installation. Many people write generic extensions that are useful for multiple organizations. 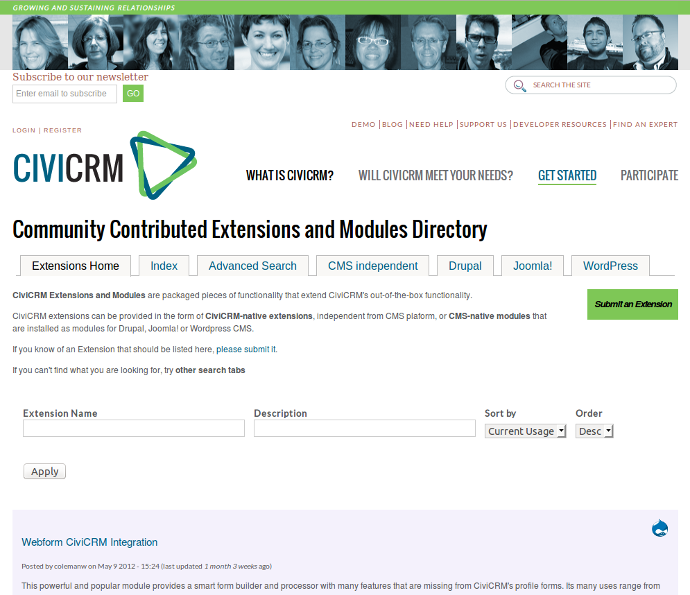 Extensions that are useful to multiple organisations can be published in the CiviCRM extensions directory. The extensions directory is available at https://civicrm.org/extensions. It lists extensions that have been written by members of the CiviCRM community and made freely available for download by other organizations. Extensions are by default listed in order of popularity (which is calculated by the number of sites that report using the module). Extensions are organized into two broad categories: 'native' extensions which work with any CMS, and CMS specific extensions that add integration between CiviCRM and the CMS and hence are CMS specific. If you are familiar with your CMS, you may know CMS specific extensions by another name, for example Drupal specific extensions are typically called Drupal Modules and WordPress specific extensions are called WordPress Plugins. Extensions that have been approved for automated distribution can be easily installed directly from your CiviCRM installation. When configured correctly, extensions can be installed directly into CiviCRM via the user interface. Go to Administer > System Settings > Extensions. 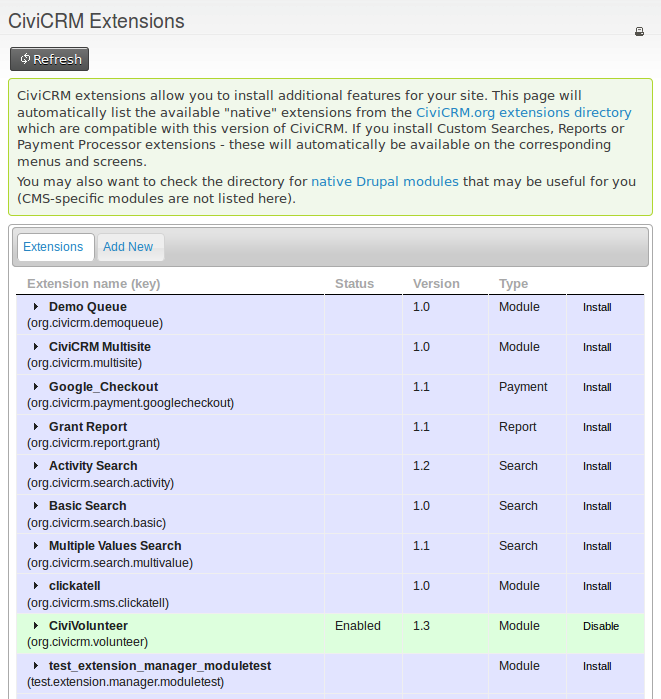 You should see a list of extensions that are compatible with your version of CiviCRM. Note that you may not see all the extensions that were listed in the extensions directory as they may not be compatible. If you do not see a list of extensions here, it may be that your system is not properly configured to manage extensions. You should consult your system administrator if this is the case. Anyone is free to write an extension to enhance their CiviCRM installation (or commission someone to do so). Writing an extension is a task for a developer so a detailed discussion of how to write one is outside the scope of this book. If you do write an extension to cater for your particular use case, you may wish to consider if other organizations would also be able to benefit from your work and hence whether you should publish your extension and make it more generic. Publishing your extension and attracting users brings many benefits in the shape of feedback on how it can be improved, bug reports, and code contributions that may enhance your extension.